Kind of neat, wonder if the panels lock together like laminate flooring. 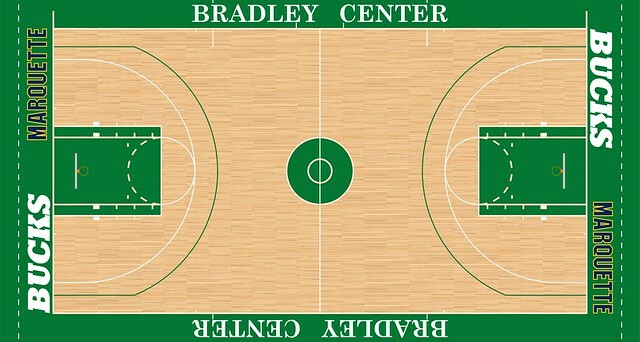 We should build on our legacy of innovation and have custom floor half court designs for some games. Or coordinate the floor with different jerseys. â€œI want beavers. I want beavers around me. I want to hire beavers, I want to recruit beavers. Beavers do only one thing â€“ they chop trees. Thatâ€™s all beavers do. Those are the kind of people I want to be around other than my wife, and thatâ€™s it." Just change it back to this one and be done with it. Nah, bring back the MECCA floor. First time I became aware of Marquette was as a child in the early 90s. I’d watch all the Chicago Bulls games and when they were playing in Milwaukee I asked my parents why does it say Marquette on the court. That court is how I found out Marquette even existed. Very cool story. I was attending MU during the heyday of this court, and always loved the way the block MARQUETTE “popped” on TV. We got a lot of free advertising out of it during a couple NCAA tournaments hosted by the Bradley Center as well. Yeah! The Marquette Fighting Irish! ...and is that the old college mens 3 pt line?